A beautiful boat on a fresh water lake with low hours. Powered by two 5.7 L 250 h.p. Mercruiser engines with only 163 hours. There are Bravo III outdrives, a vhf radio w/antenna, a Lowrance depth indicator, a am/fm stereo radio with cd player, and a television with a dvd player. The galley has a double sink, a cook top, a GE oven, a microwave oven, a full size refrigerator, hot and cold pressure water system and two ice makers. There are two electric heads, two 50 gallon holding tanks and two showers. 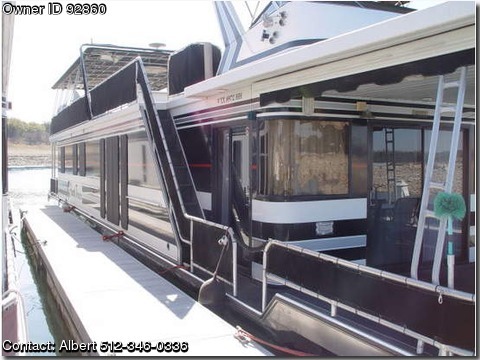 There is an aft deck shower, a rear view backing camera, a custom upper deck stereo with an amplifier and subwoofer. There are two sets of patio furniture, three ceiling fans, a bow thruster with two 8 D batteries. The boat sleeps eight and has a 15 kw Westerbeke generator, and a three ton Craine heating and air-conditioning system. There is a compass, a spotlight, an automatic fire suppression system. The boat is black with cream and rose interior.